Although it is winter we still experience high temperatures during the day and a need to stay hydrated especially if active; be it running,walking,hiking or cycling- all great all terrain activities. Drinking water is healthy and should be part of your daily routine. A good quality bottle is an essential part of your everyday routine, but not just any bottle and avoid refilling standard plastic bottles as that is unhealthy, commercial bottles are designed for single use,refilling can lead to bacterial contamination. On that point wash your bottle before refilling it! 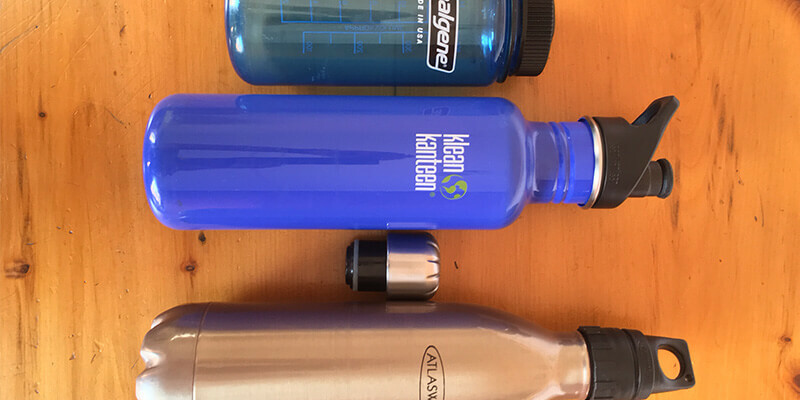 So what do we need to look for in our water bottle given that we use it on a daily basis? It should firstly be reusable and you will feel proud as it saves on plastic pollution and saves money! Check the caps and drinking spouts to ascertain that the bottle will not leak,especially given that it may be carried in a backpack with other electrics such as a tablet,laptop or a camera. Choose quality materials that will last.Bear in mind that accidents take place and you could drop the bottle or it even rolls out of your vehicle onto the tar- look for food grade stainless steel,glass or BPA free plastic. Check that the capacity will meet your needs, it should ideally last for a longer trip as opposed to a quick dash around town – generally I find a 500ml bottle to be sufficient.In this instance also check the weight as it’s no use having a heavy bottle in a backpack for a whole day – various materials have varying weights yet in some respects heavier stainless steel bottles may retain coldness longer-it is a balance. Does it fit? Ideally it should fit into the console and door panels of your car as well as a bike cage and the elasticated side pouches on a backpack. Taste is important,glass is tops in this area but subject to easy breakages unless in a protective sleeve.